This was a birthday present: when I found out it was coming out, as I had loved "Le livre qui dort", I asked my parents for it! Watch here a short video I have made to introduce the story, then come back to read the blog and all the ideas! This is a book which is part of a small series where the book itself is the main character and interacts directly with the reader(s), which children really enjoy. In this story, the book is in love... but who is it in love with? Get in touch with me if you would like to find out! As a class, they can all try to guess what the book might be about before it is opened. 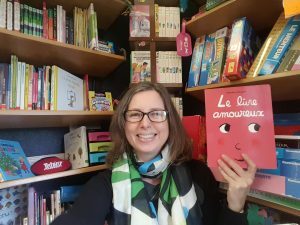 This is an interactive story, so with gestures (making a heart with your hands, pointing) and actions which they will join in with, as soon as the 1st reading, all in French, the children will understand what the book is about. This story is about a book that wants to be read, that wants its pages turned, so it is also a story about the book as an object, about treating it well and about reading. It is a very sweet and warming story which will potentially calm the children down at the beginning or at the end of a day. You can, as a class, extract vocabulary from the story: interesting adjectives (morose, amoureux, timide, fort, joli, petit, touché, content), nouns useful in the classroom (livre, doudou, jouet, oreille, page, sourire, câlin, geste, dessin, bisou), verbs (forms of être, oser, parler, demander, aller, chuchoter, lire, tourner, faire, regarder, vouloir, aimer). Some of these words could be displayed around the classroom next to photos of the children doing actions to represent words eg hugging, turning the pages). They are much more likely to be able to remember them when they have been put in context and have a better chance of being able to recycle them. You can use this presentation which I put together to help you use it: le livre amoureux. If you like this book, you will love "Le livre qui dort" (blog here) and "Le livre en colère". More about the authors and all their books here! Those I have written a blog about can be found here. Some of them you can also buy in English, like "Help, the wolf is coming" and "Shhh, this book is sleeping". This story is available to buy here at Amazon.co.uk. I am looking forward to more books in this series! Do you know of a story where the book is the main character? If so, please share it in the comments below!